Why Today's History TV Soaps Are Harmful For Kids.. Most of us remember the TV epics Ramayan and Mahabharat. With these fabulous mythological series, we have witnessed our glorious history and chronicles. As per my parents, people used to worship the character of Ram in Ramanand Sagar’s Ramayan. They put agar-batties in front of TV before serial used to start and many used to see it folding their hand in pranam mudra. I personally love Mahabharat more because I have watched all of its episodes. With each episode, I used to eagerly wait for next Sunday so that I could see what happened next. 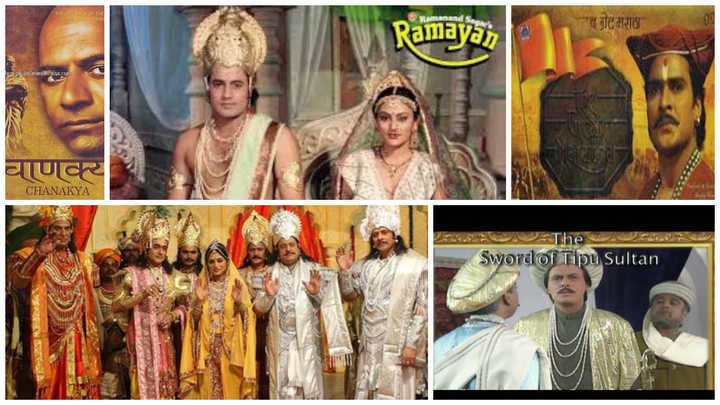 After these two biggest epics of TV entertainment, various mythological serials have been made. A few on Hanuman, some on Krishna and many were re- portrayal of Ramayan and Mahabharat. Except Ramanand Sagar’s Shree Krishna, none of them could give me that excitement again which I used to feel while watching B R Chopra’s Mahabharat series. Along with these mythological TV soaps, we have seen plenty of historian series. Some of them were absolutely stunning and breathe taking. Let me name a few of them. Bharat EK Khoj, Chanakya, The great Maratha and The sward of Tipu Sultan. TV has changed a lot since our childhood. We were still struggling to understand what Ekta Kappor (and others) was trying to depict about Indian family systems with her daily soap operas, the Indian TV has stumbled upon a topical genre of serials known as “New Age Historical serial” to further dramatize and stereotype mythical and historical facts and characters. With this blog, I want to raise my concern the way today’s mythological and history serials are bending the truth and changing the past. Very cleverly today’s serials are enjoying the freedom of showing anything by simply putting on a disclaimer for viewers to understand. These historian series are manipulating facts and events on their will to create Masala out of our history. I must say, with new technology, these history serials are using bigger and bigger sets and 3D animation to imitate things. Kids, these days, are a big fan of these history serials. I know many families where kids are dying to watch TV serials like Chakravartin Ashok Samrat, Prithviraj Chauhan, Maharana Pratap and Chandragupta Maurya. Tactfully TV channels advertise them with keeping in mind the huge crowd of kids who easily get inspired by lucrative promotions of such history TV serials. Not only kids, even adults are followers of history TV serials. Chakravartin Ashok Samrat was a big hit in my family. My family members used to finish all their engagements before 9 PM so that they could enjoy this serial. But this has been in controversy since its inception due to numerous inaccuracies. The presence of Chanakya in Ashoka’s time itself made me doubts over the authenticity of sources used to write the script. To fix my doubts l, I went through many e-books and websites to understand what happened during Ashoka’s time. Sadly there was no connection between reality and what was shown in Chakravartin Ashok Samrat TV soap. Another glorified version of history serial was Jodha-Akbar. This was absolutely useless in terms of showing who actually was Akbar. But, the saga is known for its minute long disclaimer. I have a list of such history TV soaps which are playing with facts and showing what they can easily sell to viewers.
. I know, they are going to read their history books as part of their curriculum but visuals are more powerful than textbooks which everyone hates. I have seen kids discussing how Ashoka (of TV serial) was fighting with a group of 50 people just to save his girlfriend. This proves that they are able to remember what serial has served them. I also agree that we can’t convince kids to stop watching such fictitious TV soaps. But one thing we parents can do is to keep telling them that they are fabricated and mythical. The best version is there in our history textbooks. If not there, then we can help them to reach the content of an authenticated internet source. Be careful, all internet stuff is also not genuine. Our role as parents is to help our young minds in differentiating between myth and truth.